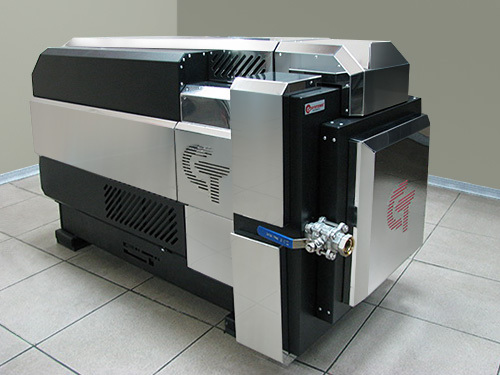 “Blazar-CT” is a new generation of hydrodynamic cavitation processors. The unit was worked out by our engineers for high-duty fully automated modules of productivity 1000 liters of biodiesel per hour. The main difference from the “Pulsar-CT 215-B” model is a new, patented method of conversion of flow energy into cavitating flow inside magnet field. The method lets to manufacture cavitation biodiesel processors of high capacity. The cavitation processor “Pulsar-CT 215-B” has proved itself as a very effective and reliable unit, but because of some design features its productivity is restricted by 500 liters of biodiesel per hour. As a result one “Blazar-CT” can replace two “Pulsar-CT 215-B” processors. It is possible to build compact modules with practically unlimited productivity based on “Blazar-CT” processors.